St George’s Day is celebrated on the 23rd of April. Saint George is the Patron Saint of England and also the Patron Saint of soldiers and law enforcement officers, so naturally, Lord Baden-Powell, a General in the British Army, himself, would find him fitting as Patron Saint to all Scouts around the world. His flag is the red horizontal cross on a white background and his emblem is a knight slaying a dragon. The legend goes that George was a son of a nobleman in the Roman army, and became a cavalry officer. George became a Christian and decided to leave the army and travel to the palace of the Emperor, Diocletian, to plead with him to stop his cruel persecution of Christians. As he rode on his horse through Sylene (in present-day Libya), he found that one of the cities was plagued by an evil dragon that lurked in a swamp. This terrifying creature could only be pacified by feeding it with human bodies, and every day one of the citizens was chosen by drawing lots and was sacrificed. The King’s own daughter, Cleolinda, was going to be the victim on the day that George arrived. He hurried to help her, even though his only weapon was a spear. With awesome courage he charged on his horse, knowing that he had only one shot at killing the fire-breathing dragon. He succeeded and saved the princess’s life. After talking to George, the grateful King, the princess, and many of the people decided to become Christians. George continued to the Emperor’s palace, but Diocletian had him put to death on 23rd April AD303 for his Christian faith. Why did Baden Powell choose St George to be the Patron Saint of Scouting? The black and white sketches shown here were drawn by B-P, and illustrate how he felt Scouting should embody the virtues of Saint George. The Footsteps of American Saints program is a series of religious activities that encourage youth to learn about several individuals who have shaped the landscape of Catholicism in America. Through a knowledge of the lives of these Saints and Blesseds it is hoped that participants will be inspired to imitate their heroic virtues and follow in their footsteps. The goal of these activities is to share the lives of several saints so that the youth might relate to what these people have done and maybe look to these individuals as role models. While the activity is Catholic, in nature, it is open to those of all faith backgrounds and denominations. A patch with the saint’s likeness is available for each activity. 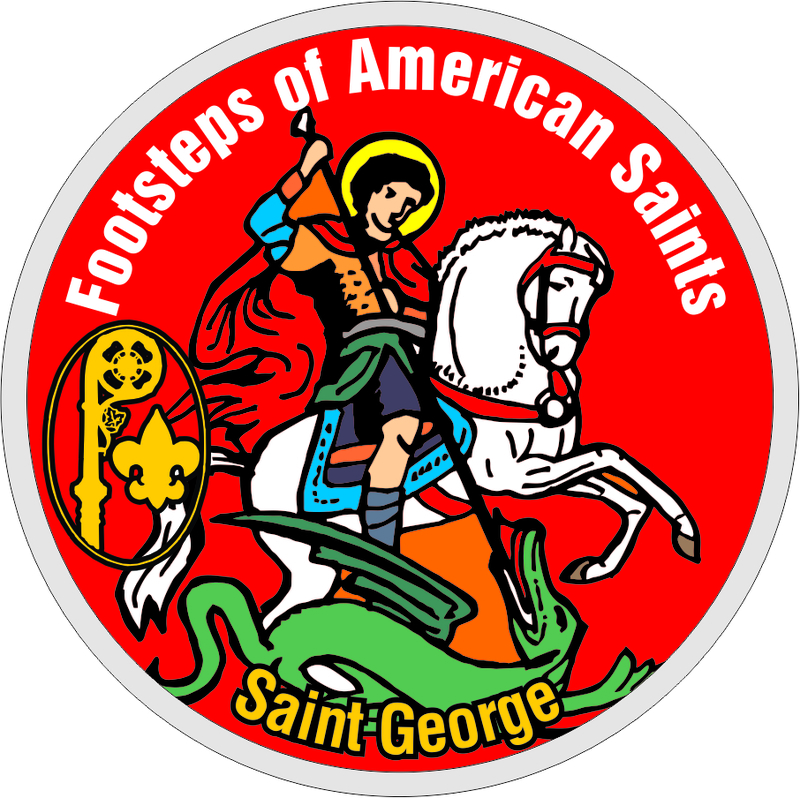 To earn the patch, simply complete the activities listed in the Saint George Footsteps of American Saints flyer.